Long before Joel Schumacher made Batman and Robin, he had already cemented his position as a schlock director with the 1985 cinematic stinker called St. Elmo’s Fire. He actually wrote and directed this movie, so there’s no wiggle room to say it’s not his fault this film turned out so badly. I get the sense this was trying to be the 1980s version of American Graffiti, but it went horribly wrong. There’s the misunderstood rebel (Rob Lowe/Paul Le Mat), the lovesick dreamer (Emilio Estevez/Richard Dreyfuss) and a few other elements in common. There aren’t enough similarities to do an entire Movie Matchup, but they’re close enough that we can see they follow pretty much the same pattern: A group of young people on the verge of major life changes must make decisions and live with the consequences. Before I point out this movie’s numerous flaws, let’s talk about the one thing movie gets right – its soundtrack. David Foster produced the soundtrack for St. Elmo’s Fire, and he also wrote most of the songs on it. I’m a big Chicago fan (the band, not the city). To me, it represents the pinnacle of 1980s music. Pretty much anything that David Foster (or Peter Cetera, for that matter) has done is spectacular, and this soundtrack is no exception. Almost every song is wonderful, and I wouldn’t mind listening to all of them over and over. Here’s a list of all 10 songs on the soundtrack in order from my favorite to least favorite. Since none of these songs is bad, I won’t say the list is from best to worst. It’s a close call which songs I like better than others, but I’ll do my best to justify my choices. 1. Love Theme from St. Elmo’s Fire. I’ve loved this song since I was a little child. There is an incredible sense of longing for something greater in this song. It captures a childlike desire to grow and mature while still retaining some of the happy memories of youth. And, to quote Rufus from Bill and Ted’s Excellent Adventure, it’s excellent for dancing. 2. 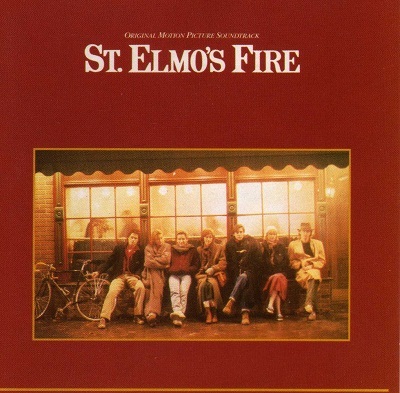 Love Theme from St. Elmo’s Fire (For Just a Moment). Hey, didn’t I just say this song is my favorite? Actually, this one is different. Someone wrote lyrics to the beautiful melody of St. Elmo’s Fire’s love theme and found a way to fill it with even more melancholy feelings. Even though this version is awesome, I still like the other one better because it’s faster and I can just imagine all the feelings going into it rather than having actual lyrics convey what it means. 3. If I Turn You Away. What heresy is this?! Shouldn’t my next song on this list be Man in Motion, you might be asking? Sorry, but no. That’s certainly a good song, but this one is even better. For some reason, I can’t get this haunting tune or Vikki Moss’ defiant voice out of my head after listening to it. It deals with a pretty depressing subject (breaking up), but it does it in a really clever way. I’d much rather listen to this than I Will Survive. Fun fact: Richard Marx (most famous for singing Right Here Waiting) co-wrote this song with David Foster. 4. This Time It Was Really Right. I have more fun listening to this song than any other on the album. The song itself isn’t deep or anything. But it’s pure Chicago. Seriously, listen to this song and ignore the fact the singer (Jon Anderson) doesn’t sound like David Foster or Peter Cetera and you’ll notice it has quite a few horns and a beat that is ripped straight from any of Chicago’s ‘80s albums. This song is really right for me. 5. Young and Innocent. This song is trying to be For Just a Moment, and it comes close to succeeding. It has a similar message of lost love. It was hard for me to decide where to place this song on this list because I like it so much. But when I’m listening to the soundtrack I’m more likely to stay on some of the other songs above over this one. It’s a near-masterpiece, though. 6. St. Elmo’s Fire (Man in Motion). Here it is at last! The titular song sets a nice tone for the rest of the soundtrack to follow. This is quintessential ‘80s music, and it even sneaks a few trumpets in to create a nice atmosphere. It’s easy to listen to, but it’s not quite in the same class as the five songs above. 7. Stressed Out (Close to the Edge). If this song was a minute shorter it would probably be higher on this list. Also, the lead singer sometimes sounds like he’s just talking rather than singing. However, I enjoy the tune and also the message, which is a little surreal without getting too abstract. It’s just good fun. 8. Saved My Life. After a great introduction, this song gets a little annoying when Fee Waybill starts singing. I can’t get a good read on the tune because his inflections are all over the place. But then when the chorus comes, it’s so good that it makes up for the shortcomings. Plus, this song knows just when to end. 9. Shake Down. This song comes the closest to being annoying. It starts with a bunch of people singing about rocking, and then continues with Billy Squier talking rather than singing the lyrics. Again, the chorus saves this song from being a disaster, but I sometimes find myself skipping this song when I’m not in the mood for its peculiar style. 10. Georgetown. This song is unnecessary. It’s basically a watered-down version of the Love Theme from St. Elmo’s Fire. I don’t like how it dumbs down the horns and makes everything sound almost like the music in a Super Nintendo video game. Wow. St. Elmo’s Fire: The Video Game. Now that’s a scary thought. Press B to be rude, A to act selfishly, X to destroy relationships, and Y to ask why this movie was made. Ugh. Back to the song. Despite its overkill quality, Georgetown still has enough of the original version to be nice to listen to. All right. I’ve talked about this movie’s incredible soundtrack. Now let’s dive into what makes the film itself truly horrendous. The problems I have with St. Elmo’s Fire boil down to two things: the characters are all despicable, and the plot is needlessly complex. How do you make a movie starring likable young actors, like Ally Sheedy, Demi Moore, Emilio Estevez, Andie MacDowell, Rob Lowe, Judd Nelson, Andrew McCarthy and Mare Winningham, and wind up with an atrocious movie full of precocious characters? I really wanted to like this movie when I first saw it. I thought maybe critics had unfairly savaged it when it came out all those years ago. But I learned the hard way that the critics were right. This movie portrays a group of recent college graduates smoking, drinking, using illicit drugs, cheating, stalking, having children out of wedlock, and other awful things. In other words, not one of these characters is happy. They’re looking for happiness in all the wrong places and acting totally immature in the process. Permit me to take a step back and talk about myself for a moment. When I graduated from college and got a job, I knew I needed to act responsibly, and not stay up all night going to parties or other such nonsense in order to keep my job and continue to live happily. These characters are completely messed up, and I find it sad that this was how Joel Schumacher imagined young people coming to grips with adulthood. I have to admit it’s impressive that the film was able to pull off so many distinct characters and interactions. I definitely remember all of the characters and their individual problems, but the truth is that none of them is worth knowing in the first place. I don’t even know where to begin with the complicated storyline. Basically, we have seven friends with different relationships and habits that they have to work through. A short synopsis simply won’t work because of all the nuances. Just follow my lead as I walk through some of the film’s biggest failures. This movie seems to capture the actors at their worst. Demi Moore plays a girl who’s talkative one moment and totally withdrawn the next. Amazingly, she pulled off playing a despondent character incredibly well five years later in Ghost. In that movie, her whole role is to stare off into space and feel sad, but she’s likable and deep compared to her character in St. Elmo’s Fire. Apparently the actress was actually addicted to drugs while portraying a drug addict in this film. It’s scary how life imitates art sometimes. I can tell the rest of the actors are trying to be believable, but the ridiculous script just negates all of their efforts. For example, at one point Rob Lowe climbs onto Mare Winningham’s house and waits for her to come up there so they can have a heart-to-heart talk. Why does he do that? I don’t know. Maybe there was a good reason, but I honestly can’t remember. But the whole situation is just so silly that anything he says is guaranteed to be instantly forgotten. As bad as the other characters are, Emilio Estevez probably got the worst role in the whole movie – and that’s saying something. There’s a fine line between persistence and stalking. And Emilio Estevez crosses it early on in the film and never looks back. He becomes obsessed with a mysterious yet kind doctor played by Andie MacDowell who he meets by accident. He can’t stand to be away from her, and he becomes increasingly desperate to get her to reciprocate his love. You can tell she’s trying to be nice to him and let him down softly, but he won’t take the hint. He creepily smells her clothing, threatens her roommate, and risks his life to follow her to a cabin in the mountains. When he finally discovers that she’s dating someone else, he just seethes with anger and complains that it’s not fair. Come to think of it, there’s a lot of complaining about things not being fair in this movie. Don’t you love characters who feel sorry for themselves all the time? However, I have to admit that this does lead to the one and only thing in the movie that I actually liked, besides the soundtrack. After facing ultimate rejection, Emilio Estevez is going to have her boyfriend take a picture of him and Andie MacDowell so she can have something to remember him by. While her boyfriend is distracted, MacDowell condescendingly says that maybe someday she’ll wonder if she’s losing out on something special by not dating Estevez. Then she gives him a quick peck on the cheek. Estevez looks away, as though in pain, but then he takes her (and the audience) by surprise by quickly turning back and giving her a long, passionate kiss. It comes out of nowhere, but it’s totally in character for him. MacDowell is absolutely stunned and Estevez is looking more chipper than ever when the boyfriend returns with a camera. He takes a Polaroid of them with their completely opposite facial expressions, and then Estevez triumphantly drives off. MacDowell just stares at the photo as he leaves, already second-guessing herself. This moment is like an oasis in the desert. Finally, something unexpected, funny and interesting just happened! I wanted to shout for joy when I saw it. But, of course, that small victory is short-lived. Like almost everything else in this film, the “climax” that it’s been building toward is a colossal letdown. Demi Moore gets depressed, so she locks herself in her apartment and opens all the windows so she’ll freeze to death. Her friends climb up the fire escape and try to get in and save her. At the same time, they awkwardly cram in the resolution of another conflict that’s been brewing through the film. Andrew McCarthy and Judd Nelson have been fighting for Ally Sheedy’s affection, and they pick this moment to nearly kill each other. It doesn’t fit at all. It’s like Joel Schumacher realized this is the end of the movie, so it’s time to resolve all the conflicts, even if it doesn’t make sense to do it all at once. Plus, I really didn’t care about their love triangle, so I couldn’t care less who gets the girl. In the end, Demi Moore is saved, Ally Sheedy and her two lovers just stay friends, and nothing is really resolved for anybody. But at least the movie is over. It’s frustrating to talk about such a bad, bad movie that both invites and defies description. To make myself feel better, I’ve decided it’s time to play Seven Degrees of Judd Nelson (not Kevin Bacon). You see, I discovered that Judd Nelson is connected to all six of his St. Elmo’s Fire co-stars in strange ways. So let’s see how they all intertwine. Judd Nelson starred with Emilio Estevez and Ally Sheedy in The Breakfast Club the same year as St. Elmo’s Fire came out. Judd Nelson also made an appearance on the TV show Moonlighting, which starred Bruce Willis, who later married Demi Moore, who starred in Ghost with Patrick Swayze, who starred in The Outsiders with Rob Lowe. In addition, Judd Nelson played Hot Rod in the 1986 animated film Transformers: The Movie, which starred Leonard Nimoy, who starred in Star Trek VI: The Undiscovered Country with Kim Cattrall, who starred in Mannequin with Andrew McCarthy. Kim Cattrall also starred in Bonfire of the Vanities with Tom Hanks, who starred in Turner and Hooch with Mare Winningham. Thank you, thank you. Feel free to check for yourself. So there you have it. St. Elmo’s Fire deserves its reputation as a lackluster film, but that in no way diminishes from its amazing soundtrack. I was usually too distracted by my repulsion of the characters to truly enjoy the music as I watched the film, but when I hear the soundtrack in isolation, it’s brilliant. Now if you’ll excuse me, I’m going to watch Elmo in Grouchland to help me forget all about St. Elmo’s Fire. I’m sure it’ll be way better. All photos from St. Elmo’s Fire are the copyright of Columbia Tri-Star Pictures. This entry was posted in Bad Movies with Great Music and tagged 1980s, ally sheedy, bad movies, batman and robin, demi moore, drama, emilio estevez, film score, films, funny, ghost, humor, joel schumacher, judd nelson, love, movie review, movies, music, patrick swayze, relationships, rob lowe, romance, seven degrees, songs, soundtrack, st elmos fire, tom hanks. Bookmark the permalink. I fell asleep in the theater in 1985 when watching with a group of older teenagers…It was horrible as I was expecting a great movie after watching the Breakfast Club the year prior…Your artice is spot on and…It is So spot on!!! and so very correct about the soundtrack.